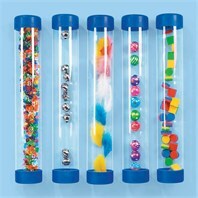 These durable ‘see-inside’ tubes are filled with objects of different colours, weights shapes and sizes. A wide range of visual effects including the prism effect from Eye Scopes, a reflective crinkly surface from the Space Blankets, magnification from the Wooden Magnifying Glass and see through Colour Shapes. Contains a whole range of effects that provide dramatic moving colour and altering shapes that will mesmerize and encourage the watcher to concentrate on the reward.